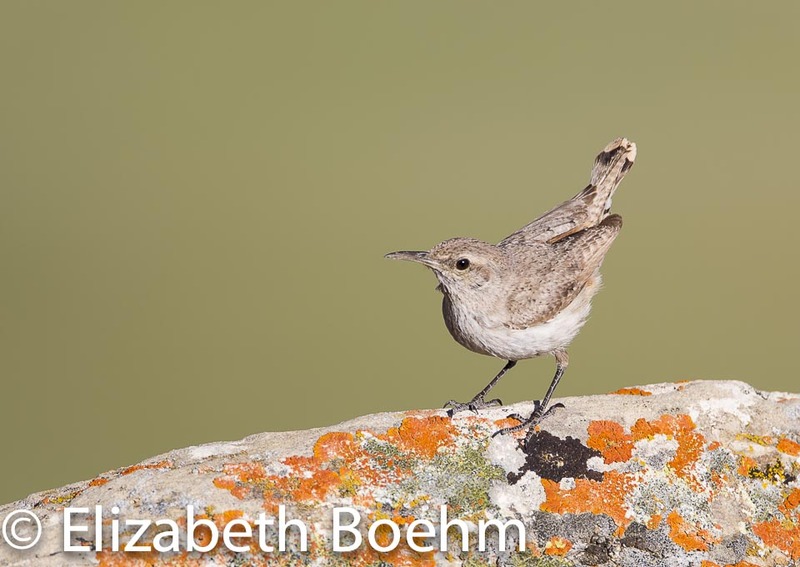 This delightful bird is found in almost any rock outcropping in Wyoming. For years I have known its call and found it in numerous places but never spent the time to watch it’s nesting behavior. 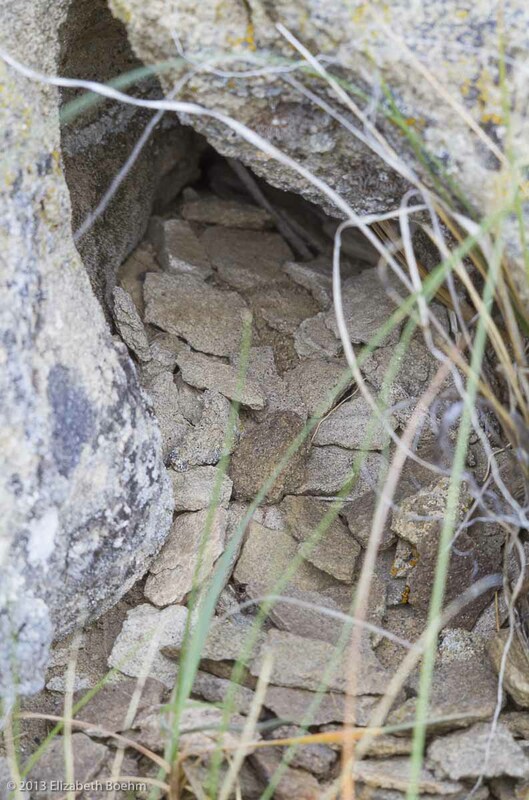 I came across an unusual nest this spring with a number of rocks at the entry. I was not positive who made the nest but suspected the Rock Wren as it was the only bird in the area which I was not aware of nesting habits. I checked the books and sure enough they describe the rock walk-way built to the entrance of the nest. No reason has yet been determined for this “paving of the entrance”. 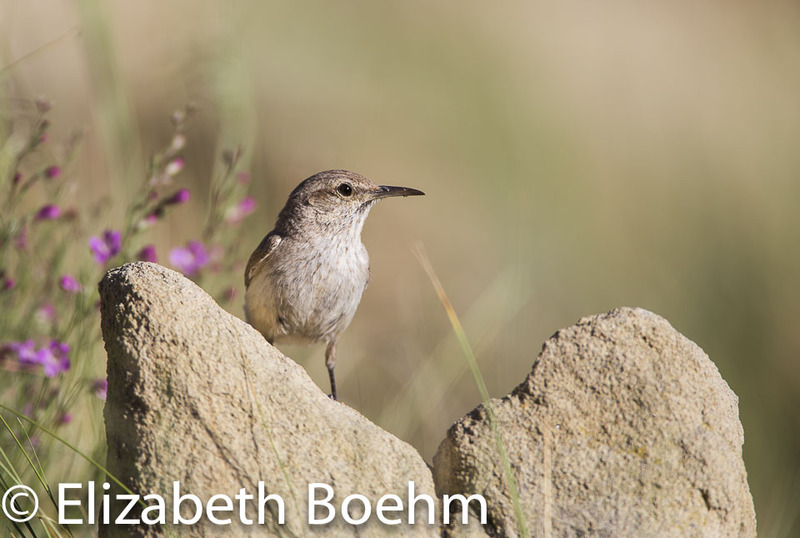 The Rock Wren is a busy little bird who forages for insects in the cracks between rocks. The wren moves quickly landing a short distance from the nest and then quickly running in with a mouthful of bugs to feed either the incubating female or the young. During nest building and incubation a call can be heard frequently, giving the photographer a “heads up” of the birds whereabouts. As the chicks become larger and more demanding the calls decrease and one needs to stay focused to catch the adult bringing in food. Challenging for the photographer, this small bird is quick. I watched and photographed this wren family in early summer of this year. The time was too short and they fledged without me. I visit the sight often and still hear an occasional call letting me know the little wrens are still around. 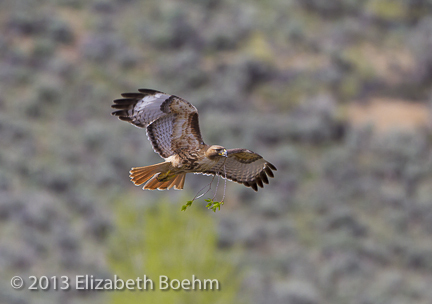 I followed a Red-tailed hawk family through their nesting season this spring. It was quite an endeavor for me as it meant 3 AM alarms and a good hike uphill to crawl into my blind before daylight. It was well worth the effort and I witnessed a number of grand sunrises and the setting of the Super Moon in June. It was truly a spectacular place to spend the morning. The female was always on the nest when I arrived but flew to a better position to watch as daylight came upon us. 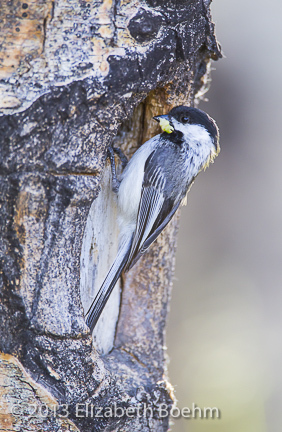 She would come into the nest typically bearing a branch of greenery from a cottonwood which she would place onto the nest. The little ones seemed to be very aware of her presence. She would call or scream frequently, especially if an intruder came through. The male, whom had a raspier call, was not always present but would show up occasionally, sometimes with food. I watched as he carried in what looked to be a ground squirrel but was then distracted by a third hawk. He dropped the squirrel and both parents chased off the intruder. I was disappointed in not seeing the arrival of the food to the nest. The little ones spent the day moving around the nest and stretching their wings. At times the Violet-green Swallows would fly by captivating the two chicks. 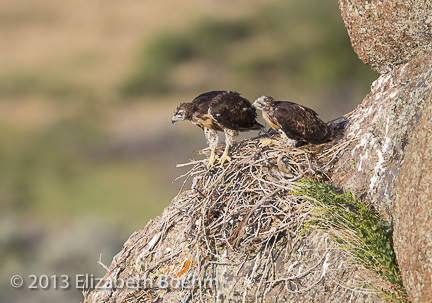 They would extend their necks and visually follow the small, quick bird as it came in close to catch bugs lingering over the nest and the chicks. 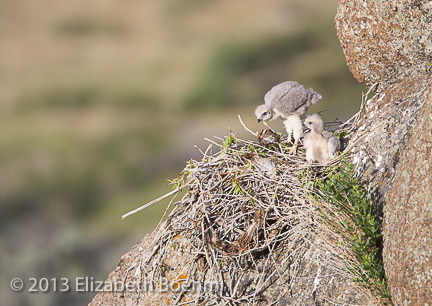 I visited the nest sight every 7-10 days and the chicks grew quickly. On what was to be my last visit, the two were quite rambunctious at first light. 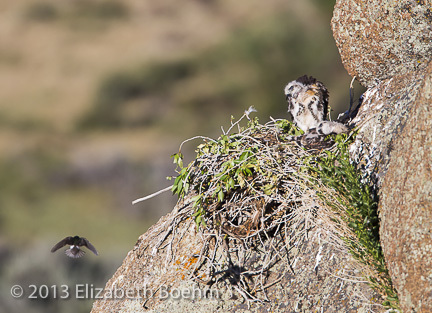 The larger of the two would jump off the edge of the nest and land on the rock below. My unfounded fear was he would fall off. 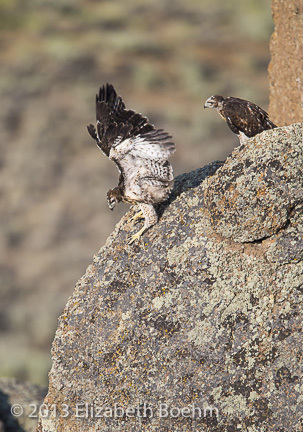 He eventually took a jump/flight and landed 12 feet below on another rock. This left the younger chick scrambling as he was not sure it was time to leave. The younger chick aborted several attempts, scrambling back up to the nest. He finally “went for it” and landed next to his sibling on the rock below. They stayed on this rock for a short time as if pondering their next move. They flew another ten feet down and landed on the ground where they hopped down the slope to climb into the cottonwood trees. I lost them at this point and had to say good-bye. It was a grand morning but I found myself a bit sad as I realized my time with this family was now over. I wish them well and hope to see the parents return next spring to raise another family. 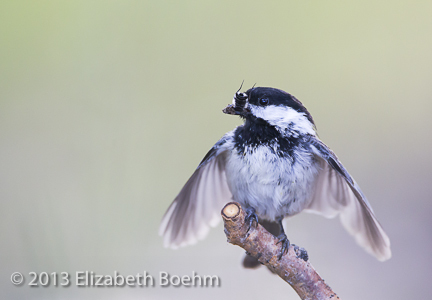 Black-capped Chickadees are often thought of as winter feeder birds and are well liked and recognized by everyone. I was delighted to find this nest sight, with tolerant parents, only three feet above the ground making it very accessible for photography. This little dynamo is a cavity nester and actually likes to excavate it’s own nest. 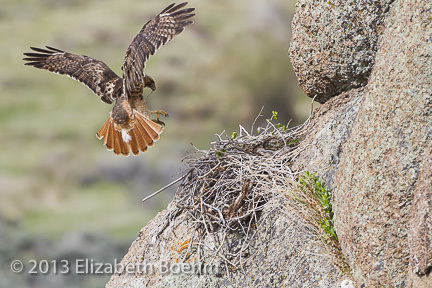 The female will tend to most of the nest duties while the male brings her food. A quiet “hey sweetie” is called by the male a short distance from the cavity as he approaches with an insect. With this call the female will pop her head up to the hole or with every 3-4 feedings will come out of the nest and fly to a nearby perch to be fed. One or the other of the birds is always close, keeping an eye out for danger. Danger which can be in the form of a local House Wren who may try to enter the cavity and destroy the eggs. The female will stay close to the nestlings early on but then will assist with feeding duties. At times, the male would seem to get inpatient with the female when she would not exit and allow delivery of his bug to the little ones. He would sit on a nearby branch and flutter his wings trying to lure her out. It eventually worked. I found myself smiling often as I watched these energetic birds raise their young!